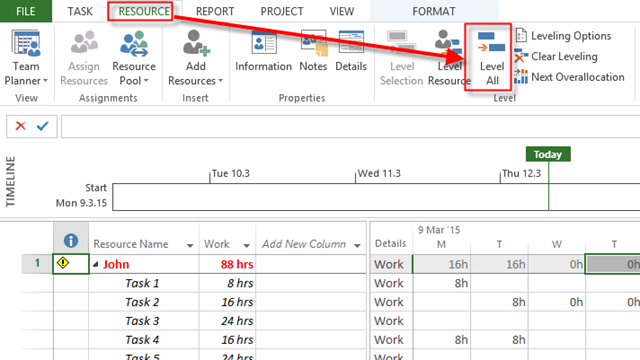 ← Critical Path in Timeline View with MS PROJECT 2013! yesterday I was teaching one of my Blog Readers about Leveling and Updating Projects in MS PROJECT 2013. The main problem was that after updating Project over allocated resources are still over allocated. I will explain the difference between those two things. I will not going to deep in Leveling in this Post. Obviously, John is very, very over allocated. As you can see John will work on Task 5, after Task 3, from Friday to Tuesday, and he is not over allocated any more. So there is a huge difference between Updating Project to status date versus Leveling Resources, and you should be aware of it. This entry was posted in MICROSOFT PROJECT, Microsoft PRoject 2010, Microsoft Project 2013, PMI, PRoject Management and tagged Microsoft Project 2010, Microsoft Project 2013 - Resources, Microsoft Project 2013 - Scheduling. Bookmark the permalink. Your explanations are the best I have come across while searching for solutions to problems in MS Project. Thanks a lot and best wishes.